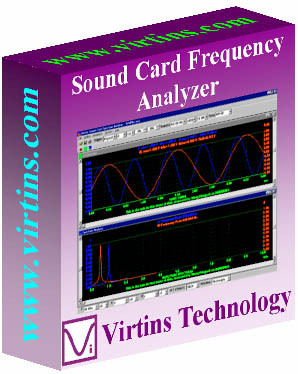 Virtins Sound Card Spectrum Analyzer is a powerful PC based virtual instrument. It consists of a sound card real time oscilloscope and a sound card real time spectrum analyzer and can run them concurrently. It features a specially designed data acquisition approach which is able to monitor the input signal continuously without missing any triggering event. It boasts a very fast screen refresh rate. Visit www.virtins.com for further details. Virtins Sound Card Spectrum Analyzer is a powerful PC based virtual instrument. It consists of a sound card real time oscilloscope and a sound card real time spectrum analyzer and can run them concurrently. Unlike most of the sound card oscilloscopes in the market which search trigger event after data collection, it features a specially designed data acquisition approach which is able to monitor the input signal continuously without missing any trigger event before the frame of data is collected. As a result, Virtins Sound Card Instrument boasts a very fast screen refresh rate (typically 15 frame per second) and thus a truly real time response. It supports sophisticated triggering method including pre-trigger and post-trigger which are generally missing from other sound card based instruments. 1. The dual-channel Oscilloscope, with all of the features of a modern digital storage oscilloscope, provides four types of views: (1) Real time wave form display of Channel A and Channel B. (2) Real time wave form display of Channel A + Channel B. (3) Real time wave form display of Channel A - Channel B. (4) Real time Lissajous Pattern display for Channel A and Channel B. 2. The dual-channel Spectrum Analyzer provides four types of views: (1) Real time Amplitude Spectrum display. (2) Real time Phase Spectrum display. (3) Real time Auto Correlation display. (4) Real time Cross Correlation display. with adjustable FFT points ranging from 128 to 32768 and selectable windowing functions such as Rectangle, Triangle, Hanning, Hamming, Blackman. Visit www.virtins.com for further details.